A portable infrared heater provides instant heat anywhere you need it, from a patio to a garage or bedroom. An infrared heating system is an efficient and effective heating method for homes, commercial and industrial buildings, and patios and outdoor living spaces. Precision Air installs high-quality infrared heaters from leading manufacturers that require little to no maintenance. 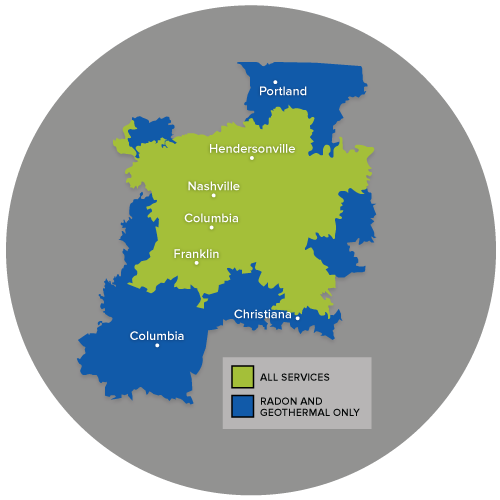 If you're interested in an infrared heating system for your home or commercial property, call or click below to request a consultation and free estimate in Nashville, Franklin, Murfreesboro or nearby. Infrared heaters generate infrared light to produce heat. Skin, clothing, floors, walls, and other objects in the room get warm when the light is absorbed. Infrared heating provides an instant warming effect, similar to the warmth felt when sitting directly in the sunlight. Unlike a forced air unit, an infrared heating system heats surfaces directly and doesn't warm the air first. When the infrared energy is absorbed by objects and people within the space, this in turn warms the surrounding air. This design makes infrared heaters more efficient than traditional heating systems. There are several types of infrared heaters, including propane, natural gas and electric heaters. They can also be made out of different materials. Some infrared heaters are portable and some are not. Our heating specialists can help with selecting the best infrared heater for your needs. Fuel savings: Independent studies have shown fuel savings up to 50 percent compared to a warm air system. Efficient: An infrared heater heats a room to the desired temperature in a fraction of the time it takes other heating methods, reducing energy use and saving money on heating costs. Low emissions: Infrared heaters burn clean so harmful emissions are low. Flexibility: Infrared heaters provide zone heating, directing warmth only where it's needed. If you're unsure whether an infrared heating system is right for you, give us a call to schedule a no-obligation consultation with one of our specialists. They can answer all your questions and provide you with a free estimate if you decide to install an infrared heater or other energy-efficient heating system. We offer heating and air conditioning installation, maintenance and repair services in Nashville, Franklin, Murfreesboro, Antioch, Hendersonville, Brentwood, Smyrna, Lascassas, Madison, Hermitage and the surrounding areas.